TOF-SIMS (Time-Of-Flight Secondary Ion Mass Spectrometry) surface analysis provides elemental, chemical and molecular information, by measuring the mass of ions that are ejected from a sample’s surface with the use of a focussed ion beam. It is a powerful surface analysis technique, providing valuable information about a range of materials. In this article we take a closer look at the technique and how TOF-SIMS works. Blue Scientific is the exclusive supplier for Physical Electronics TOF-SIMS in the UK and Ireland. If you have any questions about surface analysis and which techniques would be most effective for your research, please get in touch. 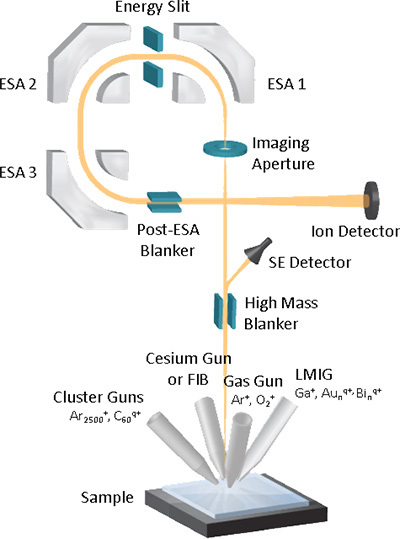 Time-of-Flight Secondary Ion Mass Spectrometry (TOF-SIMS) provides elemental, chemical state and molecular information about surfaces of solid materials. The surface is analysed to a depth of approximately 1 nm on average. The spatial resolution of Physical Electronics TOF-SIMS instruments is less than 0.1 µm. Spatial distribution information is acquired by scanning a micro-focussed ion beam across the surface of the sample. Combining TOF-SIMS measurements with ion milling (sputtering) provides depth distribution data, for example to characterise thin film structures. 3D analysis is also possible with instruments from Physical Electronics, by combining in-situ focussed ion beam sectioning with high mass resolution and high spatial resolution imaging. 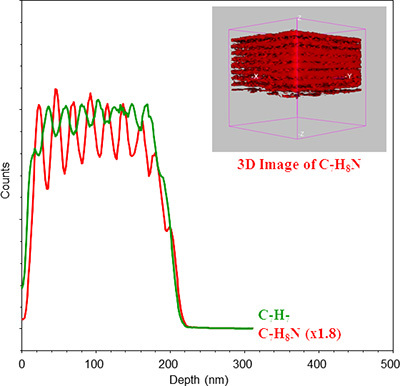 This 3D chemical characterisation technique is called HR2. The surface of the sample is excited with a finely focused ion beam. This makes the surface to emit secondary ions and ion clusters. A time-of-flight analyser is used to measure the exact mass of these emitted ions and clusters. The exact mass and intensity of the SIMS peak is used to determine the identity of the element or molecular fragments. Physical Electronics TOF-SIMS instruments work in a similar way to SEM/EDS instruments, which use a finely focussed electron beam to create SEM images for sample viewing and point spectra or images for compositional analysis. The depth of analysis of SIMS/EDS is typically 1-3 µm. In contrast, TOF-SIMS analyses a depth of less than 2 nm, so is better for analysing the composition of ultra-thin layers and nano-scale sample features. TOF-SIMS can also be used to characterise molecular information from organic materials and tissue sections for medical research, which is not possible using SEM/EDS. If you have any questions about TOF-SIMS and surface analysis instruments from Physical Electronics, please get in touch.